When tapping electric vehicles for grid needs, there’s an unwritten rule: never actually tap the EV’s battery. Almost all of the vehicle-to-grid (V2G) charging programs and pilots out there rely on modulating or turning off chargers to reduce load, not actually pulling energy from EVs back to the grid. This is to protect the precious batteries, and their warranties, against unpredicted discharge commands that could wear them out before their time. On Wednesday, the University of California at San Diego announced a pilot project meant to break this rule. Nissan and Honda will supply the nine “bidirectional” electric cars for the test, including a modified Honda Accord plug-in hybrid. The charging infrastructure will come from NRG Energy’s eVgo network, the public charging business the energy giant is rolling out in Texas, and (somewhat controversially) in California. UCSD will contribute its campus-wide microgrid, considered one of the more advanced in the world. With a core co-generation plant for heat and power, loads of solar PV, and real-time instrumented demand control across its 450 or so buildings, the microgrid provides 95 percent of its own energy needs, and can shed 6 to 10 megawatts of load on utility command. It’s also the site of a bevy of battery and ultracapacitor energy storage system pilot deployments, as well as solar and grid research projects. The technology for the pilot comes from University of Delaware professor Willett Kempton. In 2011, the university spun out the technology to European markets through a company named Nuvve. For U.S. markets, it entered a collaboration with NRG Energy, dubbed eV2g. The software allows vehicles to receive grid commands, price signals and other pertinent data from servers. It also keeps those servers updated on each car’s charging status and availability, and aggregates them into a virtual energy storage network, with the ability to ramp up and down in rate of charge -- or even export energy to the grid, in the case of bidirectional charging. In 2013, eV2g bid an aggregated fleet of about a dozen EVs into the frequency regulation market of mid-Atlantic grid operator PJM -- a first for the industry. “This is the next generation of the University of Delaware technology,” Byron Washom, UCSD’s strategic energy initiatives director, said in a recent interview. "The UCSD microgrid will deliver simulated price signals to the eVgo chargers of its need for additional energy supply from stored energy on board the Nissan and Honda autos. If [the price signals are] attractive, the nine cars will discharge back into the microgrid." UCSD and NRG aren’t announcing any plans to aggregate their two-way-charging Nissans and Hondas, even if there were enough of them in this pilot to make a dent in grid needs. Still, it’s a chance to “gather valuable insights to ensure that our vehicles are ready when similar programs move beyond demonstration and are commercially deployed,” said Nissan's Ken Srebnik in Wednesday’s release. 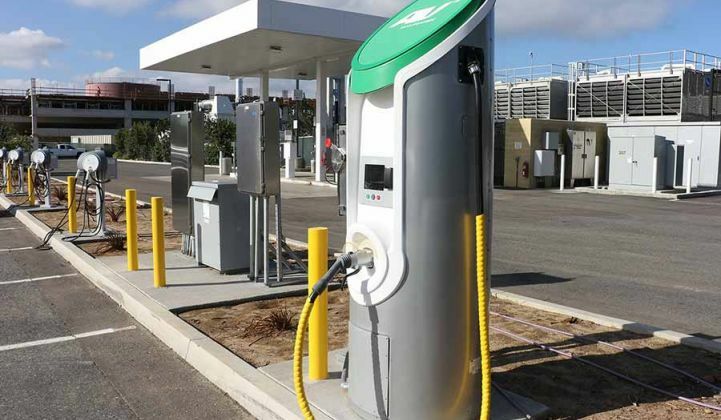 UCSD now hosts 23 Level 2 chargers and three fast-charging DC stations on campus, Washom said. That number will rise to about 70 in the coming months, with new chargers being installed as part of this project, and another that’s testing a EV-to-grid communications protocol from automaker Daimler and German utility RWE. That will make UCSD the third-largest single host of EV charging in the state, he said. But it’s still not going to make much of a dent in the microgrid’s overall operation. On a typical 42-megawatt load, “a population of 70 EV chargers operating simultaneously at 30 kilowatt-hours is not that significant,” he said. About 80 employees who drive EVs regularly charge on campus, he said, and a fair share of random EV drivers show up to top off their batteries. Looking out five years, however, EVs could be a much bigger part of the university’s energy mix. And it’s largely out of the university’s control how many students, faculty and staff will be driving an EV to campus in 2020. Many of them may live in multifamily housing where they can’t charge their cars in the garage at night, making UCSD their main provider of electric fuel. “It’s a mobile asset, and you don’t know when that asset will pop up on a certain circuit,” he said. That’s why UCSD is deep into data collection on the charging habits of its current users, he said. That’s not exclusive to eVgo, by the way -- the campus also hosts chargers from startup ChargePoint, and the Blink chargers of bankrupt, recently reorganized startup ECOtality. As part of Wednesday’s collaboration, NRG’s eVgo also plans to study typical drive-in charging needs and patterns at one of its fast-charging stations on campus, to see how they can be balanced with solar power, battery storage and control systems. Mitigating demand charges -- costs assessed based on a customer’s total power usage at any one moment -- will be one of the targets of the project. It’s also trying to increase the EV driving population through a low-cost lease deal for Daimler’s smart EVs, he said. Those cars will use the ISO 15118 standard, which has been widely adopted in Europe for communications between EVs, charging stations and utilities, but hasn’t yet been used in the United States.